It’s time to look back what I have done this month. I walked/jogged 20 mornings in total that was 51km. In November I walked/jogged for only 13 mornings of total 30km. I don’t have a coach from what I have read the FAQ is always about what is better for you between jogging and brisk walking. From my own experience I agree with this article that walking fast is a lot stressful for the muscles due to the efficiency of your body for the same speed as jogging. Some said running/jogging, which is a high intensity workout, will burn mostly stored carbohydrates for fuel. Walking as low-intensity workout will burn fat. I really don’t know what is correct as I don’t see any change when standing on a bath room scale after 2 months. I still don’t have a clue as to what is best for me perhaps there isn’t an absolute good-for-all solution. A more academic argument such as this suggests that if you are overweight or have a cardiovascular condition walking is better especially for those who aren’t used to high intensity exercise because your body has to take few times more stress when running. This is a must see if you like old photos. You don’t like old photos? Congratulations you are too young and you can skip this blog of mine! This year I am lucky to have grabbed a desktop calendar with old photos donated by Hedda Morrison (1908 – 1991). Let’s look at Hong Kong 70 years ago when even your dad/mom were young kids. Friend of mine just forwarded me one of those circular emails, this one is meaningful requiring deep thoughts. A professor stood before his philosophy class and had some items in front of him. When the class began, he wordlessly picked up a very large and empty mayonnaise jar and proceeded to fill it with golf balls. He then asked the students if the jar was full. If you spend all your time and energy on the small stuff you will never have room for the things that are important to you. Pay attention to the things that are critical to your happiness. Spend time with your children. Spend time with your parents. Visit with grandparents. Take time to get medical checkups. Take your spouse out to dinner. Play another 18. I do go out with friends once in a while but not for a couple of beers for me instead I take Coke or lemon water. I don’t play golf at all so I started to learn jogging due to the findings from routine medical checkups. The philosophy behind an analogy like the above can be easily understood but the trouble is that when it comes to choosing your golf balls for life most people have a misconception that his mayonnaise jar is infinitely large and couldn’t tell sand from golf ball. There is however one dimension that the above analogy has omitted, i.e. time. The Jar doesn’t last forever don’t believe that you may have a second chance to replace the pebbles or sand with golf balls you like later on. The ability to pick between golf balls, pebbles and sand depends largely on one’s value system and life experience. If the above was really taught in philosophy class (we don’t have this in our education system) students will still be putting the wrong stuff into their jar believing that they could always turn his/her jar upside down and start again. How many times you could turn your life upside down and start again? I can only do brisk walk and may be I’ll be able to jog for the second half of this steep uphill section later. 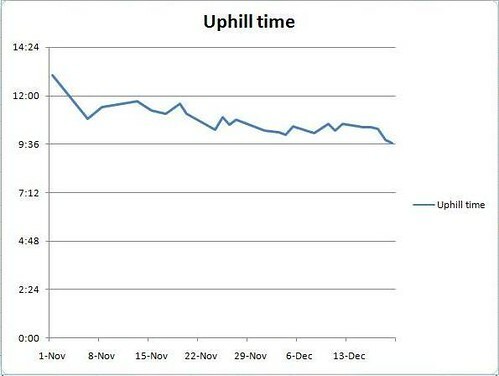 My performance for the last one and a half month is plotted below.